Excited to announce my new book! Ultrasound of the Male Genitalia presents a comprehensive, evidence based reference as well as a practical guide for the performance and interpretation of the male genital ultrasound examination. The volume begins with the history of male genital ultrasound and includes a discussion of regulations surrounding the performance of ultrasound examinations by urologists. The book provides a comprehensive review of ultrasound physics, image quality and patient safety. Normal ultrasound anatomy and common pathologic findings are covered in depth. Illustrations are used throughout the text to clarify complex topics. Practical scanning protocols for both the testes and the phallus, which are compliant with both accrediting organizations and third party payers, are described with their corresponding images. Also, included is a detailed discussion of color, power and spectral Doppler as well developing technologies such as sonoelastography in the diagnosis of male genitalia pathology. 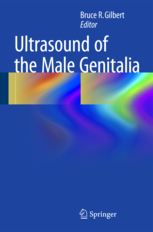 With broad contributions from authorities in the field, Ultrasound of the Male Genitalia is a valuable resource to urologists, andrologists, fellows and residents and others interested in male genital ultrasound.